The DJC wrote that developers concerned about Portland’s proposed Inclusionary Housing program* are putting “forward an alternative proposal that would ramp up adoption of inclusionary housing requirements over several years and offer more generous incentives than the city’s plan”. According to the Willamette Week Mayor Hales is proposing to rescind Portland’s ban on apartments without parking, enacted in 2013. The Oregonian reported Zidell will miss the first deadline for construction in South Waterfront. Under the terms of the 2015 Development Agreement a mixed use project at Zidell Block 1 was due to begin construction by the end of this year, but has yet to move forward. Newly appointed PDC Director Kimberly Branam has said that the PDC “over-promised and under-delivered” to the poor, the elderly and people of color in North and Northeast Portland. The November issues of the NW Examiner reported [PDF] that the developers behind the Block 20 tower in the Pearl will use acoustic wrap to reduce noise from the impact-hammer pile driving. The paper also broke the news that the developer behind the redevelopment of the Northrup Market at 1120 NW 21st Ave has walked away from the project. 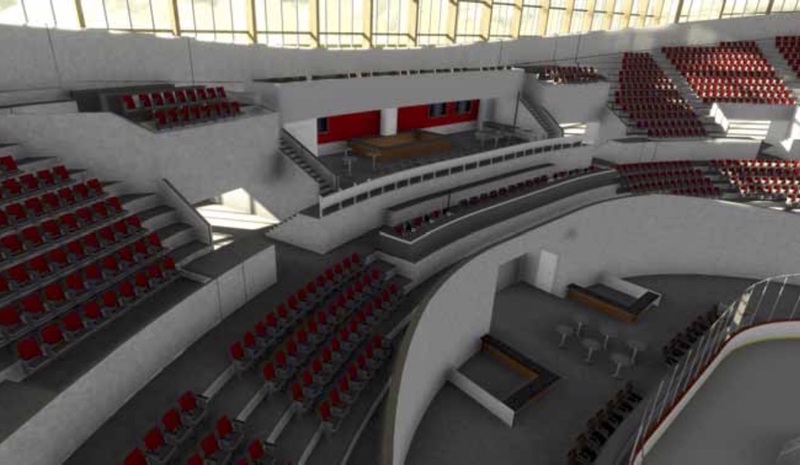 Image of a potential “north end party deck” at Veterans Memorial Coliseum, identified as one of the potential improvements by the 2015 study into the building. Veterans Memorial Coliseum was declared a “National Treasure” by the National Trust for Historic Preservation. Described by Curbed in article about the designation as “one of the finest International-Style civic buildings in the west”, the fate of the building remains unclear. A report published last year identified a number of options for the building, ranging from demolition to major improvements, however the Portland City Council has yet to take any action on the report. The Portland Chronicle reported on the ten story building at 1500 SW Taylor St, likely to replace the 1892 Holman House in Goose Hollow. BikePortland broke that the news that Tesla Motors will build a missing section of the Willamette Greenway Trail, as part of their new showroom and repair center at 4330 SW Macadam. Initial plans submitted to the City indicated that they would not build the trail. 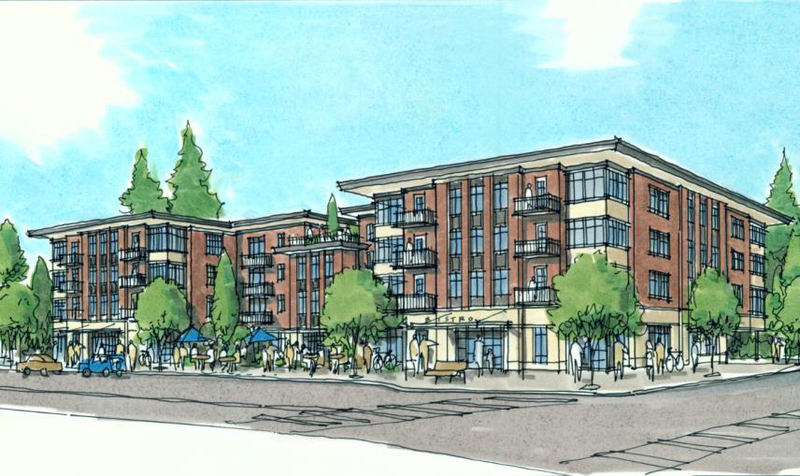 The Portland Development Commission will own a new mixed income building in Lents Town Center at 9101 SE Foster Rd. The public agency is taking over development from the original owner, Williams & Dame. The City Council is getting ready to ask voters to approve a $250 million bond measure, to fund affordable housing. If approved, the measure would add $75 a year to the taxes owed on a typical single family home. Central City Concern published a blog post about their current affordable housing developments. Miracles Central is scheduled to open in August of this year, with the Hill Park Apartments at 110 SW Arthur following in Spring of 2017. Bloomberg wrote about D.R. Johnson, the Riddle, OR company that is the first domestic manufacturer of Cross Laminated Timber (CLT) panels. CLT is new to the United States, but has a long history of use in Europe. Current CLT projects in Portland include Albina Yard, Framework (Pearl) and Carbon12. KGW had a sneak peak inside the nearly complete Yard tower at the Burnside Bridgehead. The Oregonian reviewed a Portland Art Museum exhibition about Portland-based Allied Works Architecture. The Block 8L building in Skidmore Old Town, which is now under construction. The design was cited as an example of the positive contribution made by the Historic Resource Review process. The Historic Landmarks Commission has presented its 2015 State of City Preservation Report to the Portland City Council. The report gave an update to the Council on the work of the Commission, made suggestions for priorities to be addressed in the coming year and identified potential threats to historic resources in the city. Presenting the report was outgoing Chair Brian Emerick, joined by Commission member Kirk Ranzetta. A similar report was delivered earlier in the year by the Design Commission. 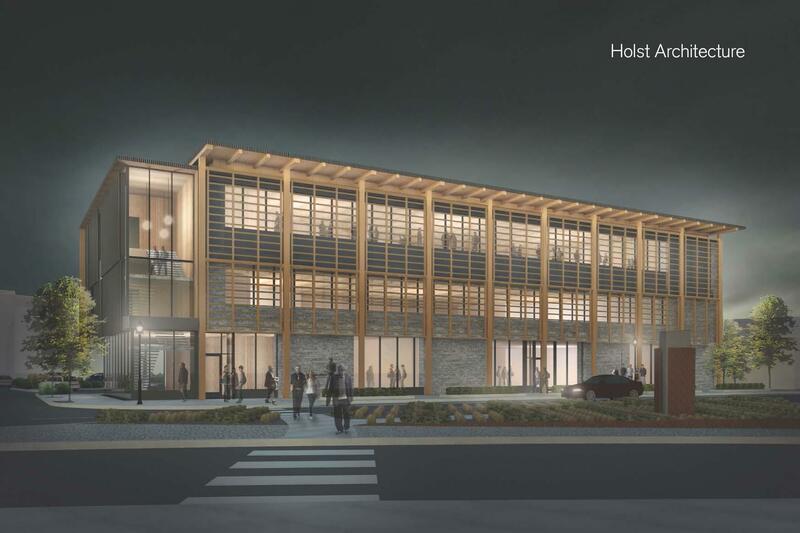 The Portland Business Journal took a first look at three projects in Lents Town Center, including Oliver Station by Anrkom Moisan Architects, the Asian Health and Services Center by Holst Architecture and 9101 SE Foster Rd by Hacker Architects. With all three buildings at Hassalo on Eighth now open, the Portland Business Journal published a photo gallery of the completed project. The Portland City Council voted to spend $67 million more in Urban Renewal money on affordable housing, wrote the Portland Mercury. Also approved by the Council was a resolution instructing the Portland Housing Bureau to perform a nexus study on whether Portland should introduce a “linkage fee” on new residential and commercial developments. During the hearing on housing affordability, Commissioner Steve Novick proposed an amendment to demolish Veteran’s Memorial Coliseum, and redevelop the site for housing. None of the other four City Commissioners supported the proposal. Portland Architecture argued that in deciding to renovate the Portland Building the City Council chose to do the right thing. The Portland Chronicle looked at a site at 4926 SE Division St where Urban Development Group is planning its next mixed use development. A grand opening was held for the new Oregon Reproductive Medicine facility at 808 SW 15th Ave in Goose Hollow. 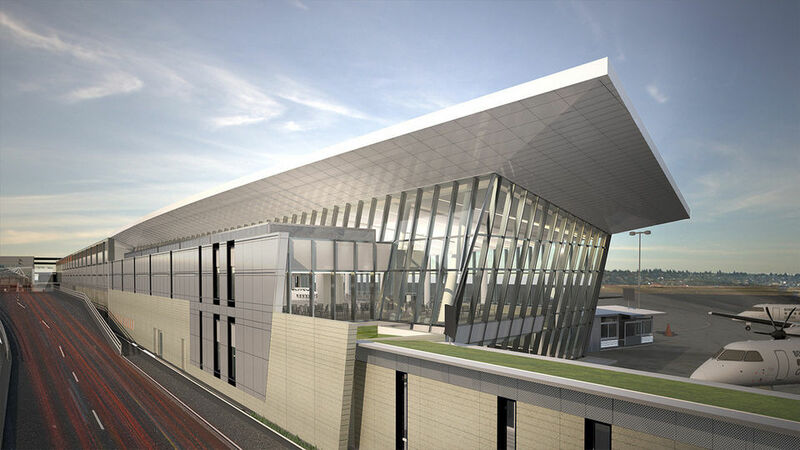 The Oregonian published images of the Portland International Airport Concourse E Extension, which will be used by Horizon Air. As part of a large project, Alaska Airlines will move from the south side of the airport to the north, while United will relocate from the north to the south. Portland Architecture made the case for the preservation of Veteran’s Memorial Coliseum, as new study has come out with multiple options for the building. The Portland Business Journal reported that the office space in Park Avenue West is now entirely leased, with Morgan Stanley taking the final two available floors. Leasing has also begun on the apartment units. Mahlum have been selected as the architects for the Grant High School Modernization, according to the Hollywood Star News. Construction on the project is scheduled to begin in 2017. The latest retail tenant at the LL Hawkins and Slabtown Marketplace is the Consolidated Community Credit Union, reported the Portland Business Journal. A four story, 30 unit mixed use building is proposed for 1515 SE 44th Ave. The Portland Chronicle looked at the existing house on the site, which may or may not be demolished as part of the project. 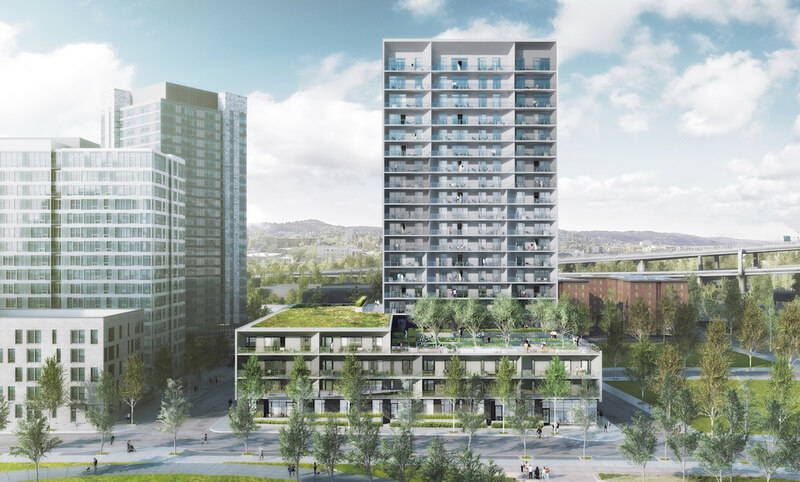 Thomas Robinson of Lever Architecture was interviewed on OPB’s ‘Think Out Loud’ about Framework, the planned 12 story wood building set to go up in the Pearl. The Redd on Salmon Street has won a design award for resilience, according to the Portland Business Journal. The Portland Chronicle covered the history of an industrial building in Sellwood at 8222 SE 6th Ave, set to be replaced by a mixed use development. Construction on The Ella in South Waterfront is moving into its final phases, according to the Portland Business Journal. The 6 story building utilized a pre-fabricated wood framing system, which minimized construction waste on site. Multnomah Village residents are attempting to block a planned apartment building at 7707 SW Capitol Highway. The building will include 70 market rate apartments, two retail units, and between 43 and 60 parking stalls. 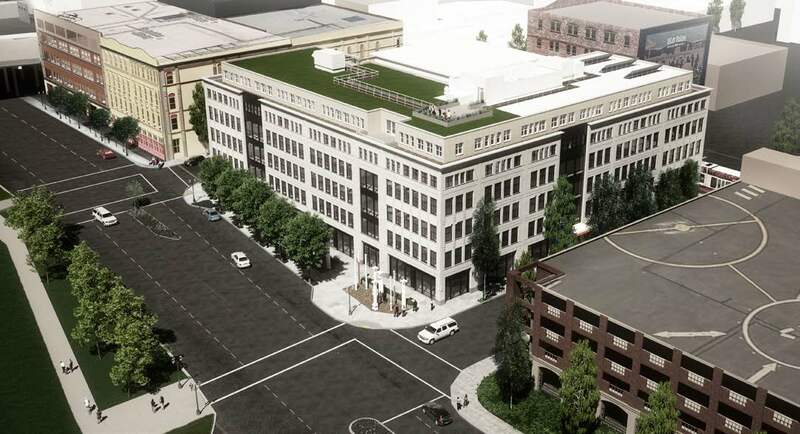 The Portland Business Journal wrote about plans for the adaptive reuse of the Stagecraft Building, one of the last remaining buildings in the Pearl suitable for conversion. A groundbreaking ceremony was held on Monday for the Japanese Garden Expansion, with architect Kengo Kuma in attendance from Japan. The first phase of the Ecotrust’s Redd on Salmon St food hub is now open and ready for tenants. The project will consist of two buildings: Marble and Foundry. Work on the Foundry building is expected to be completed in late 2016. The Pine Street Market, which is due to open late this year, was named as one of American’s 17 Most Anticipated Food Halls by Eater. It was joined on the list by the James Beard Public Market, currently scheduled to open in 2018. A study of Veteran’s Memorial Coliseum has come up with five options for how the structure could be renovated. These range for minor upgrades to address maintenance needs, to creating an indoor track and field facility. A profile of developer/architect Ben Kaiser at Oregon Business looked at his ideas for how to deal with earthquakes, in both new and existing buildings. Work on the Radiator at One North, designed by Kaiser’s practice PATH Architecture, was recently completed. United Way of the Columbia-Willamette has sold a downtown parking lot, reported the Portland Business Journal. The non profit is still considering its options for its headquarters at 619 SW 11th, however at a recent Pre-Application Conference plans for a 15 story hotel were discussed. A commercial structure at 8235 SE 17th Ave has been demolished, reported the Portland Chronicle. 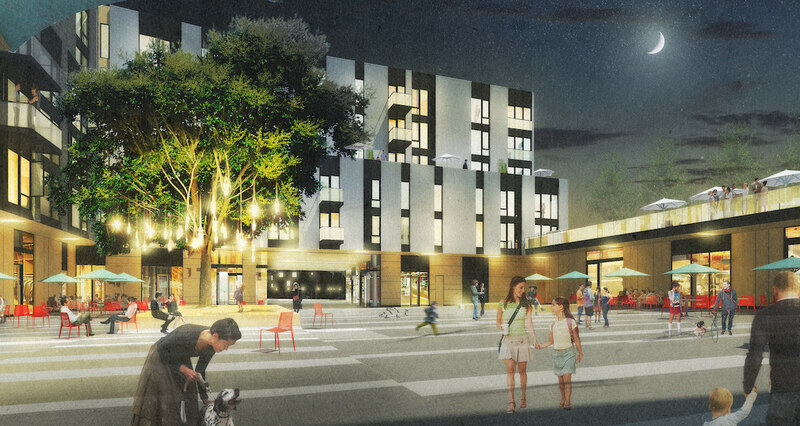 A building permit is under review for a new apartment building on the site, by developer Urban Development Group.